Published on February 13, 2010 in General T&T, Politics and UNC. Closed Tags: Basdeo Panday, Jack Warner, Kamla Persad-Bissessar, UNC. Opposition Leader Basdeo Panday yesterday “fired” UNC’s new deputy leader Lyndira Oudit from her senatorial post and replaced her in the Upper House with Public Services Association (PSA) second vice-president Christopher Joefield. 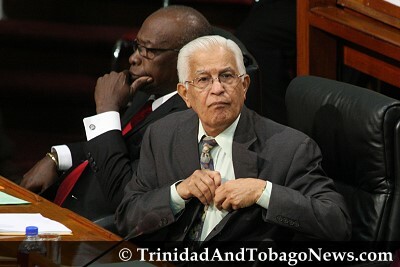 Opposition Leader Basdeo Panday made mas yesterday, firing Lyndira Oudit from the Senate forthwith and immediately appointing PSA Second Vice President, Christopher Joefield. While supporting the appointment of Christopher Joefield to the UNC’s Senate team, UNC leader Kamla Persad-Bissessar has refused to be drawn into a fight over the removal of former Senator Lyndira Oudit. UNC Caroni Central MP Hamza Rafeeq had been advised to stay in bed for approximately one week by his doctors. Couva South MP Kelvin Ramnath has refused to allow new UNC leader Kamla Persad-Bissessar to use his constituencey office hall to meet his constituents on February 22. As United National Congress (UNC) political leader Kamla Persad-Bissessar moves closer to replacing Basdeo Panday as Opposition Leader, Panday’s brother, Subhas, has agreed to chair a committee that would make the Persad-Bissessar-led UNC victorious in a local government election.